Peru has some of the best whitewater rivers in the world and along the way you'll encounter some spectacular scenery as the Andes plunge down into the lush canyons of the Upper Amazon. Cusco is most definitely the rafting capital of Peru offering popular 1 or 2 day trips on the Urubamba River and 3 or 4 day trips on the exciting whitewaters of the Apurimac River. For a really adventurous trip try the Tambopata River in Peru's south eastern jungle. Starting high in the altiplano, north of Puno, the first 4 days on the river are spent negotiating some exciting whitewater rapids. The following 3 days are spent drifting through the Tambopata Candamo Reserved Zone. Only a few companies offer this trip from Cusco including 2 days of transportation just to get to the river followed by a further 1 day transfer and flight out of the jungle at the end of the trip. The Cotahuasi and Colca Canyons near to Arequipa provide some excellent technical rafting suitable for very experienced rafters. If you are looking for spectacular views but prefer a little less demanding river then a trip on the Majes River (Arequipa) may be more your scene. Other rivers suitable for rafting include the Santa River in Ancash (Huaraz) which is popular with Peruvians, fairly easy and passes through some beautiful countryside. 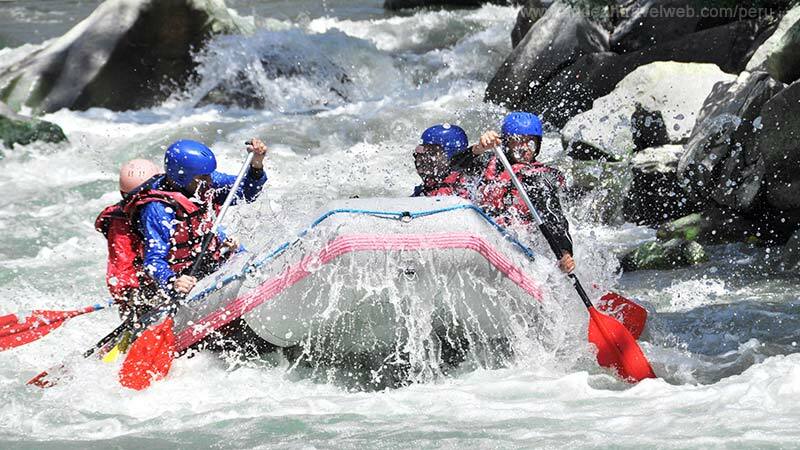 Day trips whitewater rafting on the Urubamba River are extremely popular and easily arranged once you arrive in Cusco. Typical trips depart Cusco daily at 9am and return by 3pm, leaving about 3 hours actually on the river. Trips usually include lunch, transport and all safety equipment and costs start at about $25 per person. Some trips combine a visit to the Inca ruins of Ollantaytambo or Pisac on the way back to Cusco. 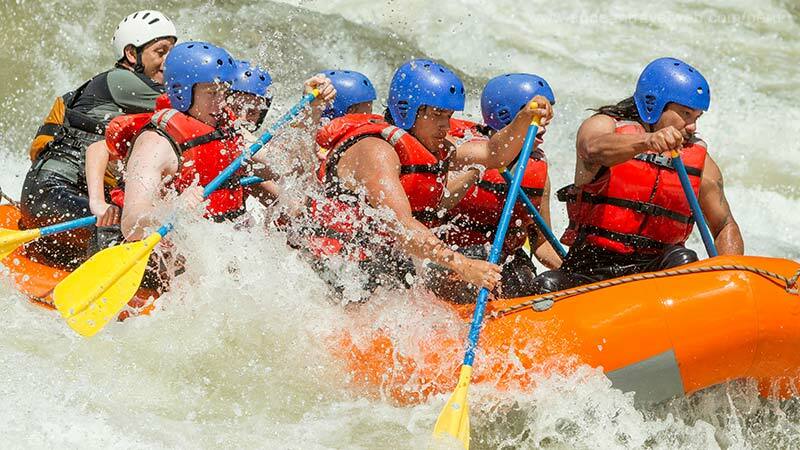 A good introduction to rafting with short and easy rapids which require no previous experience or special physical conditioning. It may be a little too gentle for some people especially in the dry season July-September, but the scenery is great. This trip is frequently combined with a visit to Pisac market and Inca ruins. Probably the most popular section of whitewater with the water being a bit more challenging with some exciting rapids. Novices can still make this run though. This trip is often combined with a visit to the Inca ruins of Ollantaytambo on the way back to Cusco. The putting-out point is usually Chilca which is only a 5 hours trek from the start of the Inca trail at Km 82. 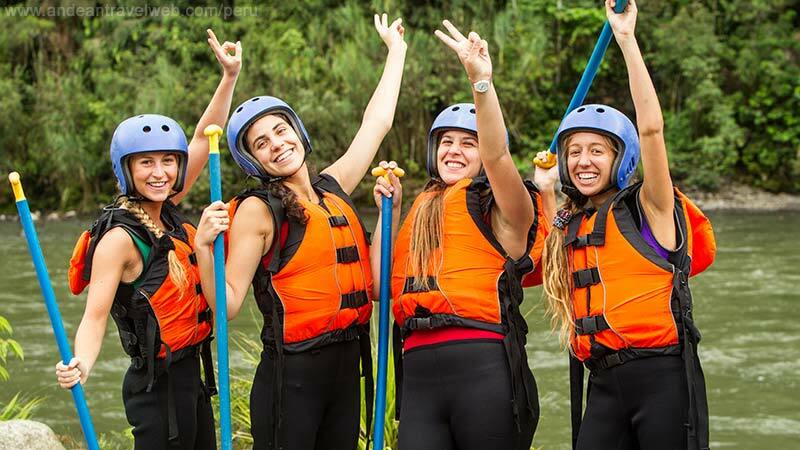 A few agencies therefore offer this trip as part of a combined 5-day rafting/Inca Trail package (half-day rafting, 4 days trekking and half-day returning by train to Cusco). This section of the river is further along the Urubamba towards Machu Picchu and provides some sizeable rapids and fast whitewater. Prior experience of rafting is necessary and this trip is not offered daily. Check with a rafting company in advance to see if they are offering this trip. The Apurimac means 'speaking God' in Quechua and was considered a sacred river by the Incas. On its way to the mighty Amazon, this spectacular river cuts deep through gorges, surrounded by steep cliffs and sheer granite walls and slowly descends into wide pastoral valleys and tropical rainforest, providing some of the most exciting whitewater in the world. Most of the time will be spent rafting class III+ and IV rapids, although there are a few IV+ and V rapids along the way. Amongst the wildlife to be found in this remote and isolated canyon are river otters, condors, foxes and torrent ducks. There are several tour companies in Cusco operating this trip (see Peru Tour Operators), all running a similar itinerary. Obviously safety is of paramount importance in this 'high risk' adventure activity, so choosing a professional company should be priority. Below we've included a typical itinerary and trip information so that you can compare the various companies. Day 1. Starting at Cusco, it's a 5 hour drive west across the gently rolling landscape of the Andes down into the Apurimac River Valley. The altitude at the start point is in the region of 2000m so you shouldn't experience problems with altitude as in Cusco. It takes about 2 hours equipment preparation and safety training before putting in after lunch. You'll raft down to the first nights camp , floating for about 1.5 hours amongst class II, III and IV rapids. The camp is within a narrow gorge with sheer sides. Day 2. You'll probably be rafting for about 4.5 hours today, mostly in Class III and IV rapids. There are some small sections of the river where you will portage (carry) the rafts and equipment. Arrive at camp, this time on a sandy beach, between 3 and 4pm. Day 3. Today you'll experience a couple of class V rapids with names such as 'Tooth Ache', 'You First' and 'Last Laugh'! It's the most exhilarating day on the water probably spending a total of 3 or 4 hours on the river before camping the night on another sandy beach. Day 4. The morning is spent quietly floating down to Cunyac Bridge and the Hot Springs of Cconoc where the group will have lunch before packing up the equipment and driving back to Cusco, arriving about 6pm. This is adventure tourism at its most exciting since this trip combines whitewater rafting, and a journey into remote and rarely visited rainforest. The Tambopata River runs through the heart of the Tambopata-Candamo National Park situated to the south east of Cusco, near to the border with Brazil and Bolivia. In the heart of this unspoiled region there aren't any jungle lodges so you'll find yourself camping on the river beaches surrounded by the natural sounds and sights of the Amazon. It's an excellent opportunity to see monkeys, giant otters, parrots, alligators, tapirs, eagles, ocelots and, if you are very lucky, maybe the illusive jaguar. You will also visit a macaw lick where hundreds of colorful parrots come to feed on the clay that supplement their diet. The trip commences at Puno on the shores of Lake Titicaca and ends in the Inca Capital of Cusco. There are only a handful of tour companies operating this specialized trip and, as you can imagine, the itinerary is pretty much the same for all of them. We've quickly summarized a typical itinerary below. We've allowed 12 days in total for this trip although some agencies offer it in 10 days. The best time for undertaking this adventure is May to November with the latter months better for wildlife observation. It is necessary to arrange the trip quite a few months in advance since, due to the limited number of trips, places fill up quickly. Day 1: Whether starting in Lima or Cusco this day is set aside for getting to Puno. The group will meet in the evening and be briefed on the following days activities. Day 2: Early morning departure from Puno heading back on the road to Cusco, past Juliaca towards Azangarao, finally reaching Cuyo Cuyo in the afternoon. This drive provides great views of the cold wind swept 'puna' or altiplano where communities look after huge herds of llamas and alpacas. After Cuyo Cuyo the road drops down into cloud forest until you finally reach the put-in point at Putinapunco (2400m) on the edge of the Amazon Basin. Set up camp and unload and prepare the rafts. Days 3-9: The daily routine includes between 5 and 6 hours rafting per day with a few stops on route. The camps are usually set up on the beaches. Time may be spent scouting some of the rapids to check routes and water levels, since conditions can rapidly change from day to day. The surrounding scenery is pristine rainforest and you'll have the opportunity to see many animals and birds. You'll also encounter class III and IV rapids. There's abundant fish in the river, so you may want to bring a line. The group will be accompanied by an expert guide to explain a lot about what you see. Some trips may include small treks into the jungle. Day 10: After a full day on the river you'll camp the night just before the Tambopata Macaw Lick (Collpa de Guacmayos). Day 11: At dawn it may be possible to observe the magnificent display of bird life at the clay lick including the brilliantly colored and rowdy macaws. After meeting up with a motorized canoe you will travel past the jungle lodges of the lower Tambopata River until reaching Puerto Maldonado where a night spent in the luxury of a hotel will, without doubt, be warmly appreciated. Day 12: Transfer from the hotel to the airport for the 30 minute flight to Cusco. A typical trip includes: Hotel in Puno (1 night), transportation from Puno to put-in point on river, professional class IV bilingual guides with a first aid box (and training to use it) , state of the art self bailing rafts, all the meals while at the river, waterproof-bags for personal luggage, helmet, life jacket, paddles, wet-suit and spray jacket, double occupancy tents, motorized canoe on last day of trip, hotel in Puerto Maldonado (1 night), Flight Puerto Maldonado to Cusco. The Rio Cotahuasi provides the scene for Peru's 'ultimate rafting adventure'. Just to get to the river involves a rugged high altitude drive followed by a strenuous 2 day hike past Sipia falls (where the river plunges 150m into an impenetrable gorge!). From then on it's 120km of technical class IV-V rapids taking about 6 days. This trip is for experienced rafters only. The company Amazonas Explorer offers this trip just once a year.